How to Write Law Essays & Exams provides law students with a practical and proven method of analysing and answering essay and exam questions. The book focuses on those questions that give students the most trouble, namely problem questions, but its techniques are equally applicable to other types of essays. In addition to providing a framework for analysing and writing law essays, the book teaches students how to identify relevant legal authorities, distinguish and harmonise conflicting legal precedents and evaluate the applicability of the law to the facts of the question at hand. 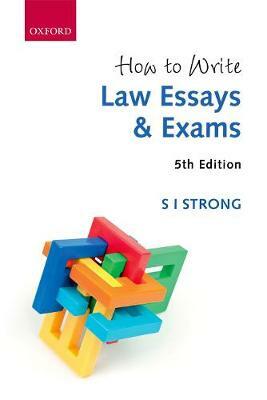 The book also contains specific law-related revision techniques and general writing tips. Designed for law students of all levels, including those on A-level, university, conversion, and vocational courses, the text helps students understand their substantive courses while at the same time teaching vital writing and analytical skills.New to this Edition:The analytical framework for answering questions is now described in terms of the popular IRAC (Issue; Rule; Application; Conclusion) methodNew content on legal citation is included to highlight the importance of referencing and crediting sources Online Resources:The book is accompanied by online resources, including: a case breakdown to help students with reading cases, frequently asked questions, and some tips on citation styles and conventions.